« Former Namibia missionary, Bishop Shannon Mallory, dies in U.S.
Young Anglicans across the Province are being invited to join thousands of young people from across the world on a five-day pilgrimage to Cape Town in September next year. 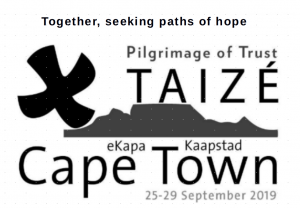 The “Pilgrimage of Trust” is being organised under the auspices of the famous Taizé Community in France. It will take place from September 25 to 29, 2019, at the invitation of Archbishop Thabo Makgoba, Archbishop Stephen Brislin of the Catholic Church, Bishop Ziphozihle Siwa of the Methodist Church and Dr Gustav Claassen, general secretary of the Dutch Reformed Church. The organisers expect up to 10,000 young people between 18 and 35. They say that “this meeting will help young people in their search for God. It will help encourage them to have a profound trust in themselves and in others. “This meeting will invite them to be attentive to the signs and people of hope present around them and encourages them to take up responsibilities to become bearers of peace and trust in the Church and in society. “The daily programme will include common prayers and times of sharing. The morning programme will be in the parishes/local churches and from midday onwards in a common venue. For these and other, fuller details of the pilgrimage, download and share the flyer at this link. Thank you very much for the information. Please send further details. I will highly appreciate it. We can’t Wait to drive down to the cape from Swaziland (eSwatini). I think this is going to be a life changing conference.. I am currently in Walvis Bay (Diocese of Namibia) and will be conducting Taize Services in my parish to mobilize and motivate a group of people to come from my Diocese. God bless and see on the Pilgrimage of Trust.